Here we have an interesting mathematical perspective on Buddhist teachings from sangha member Colin Shinjo Salmon. I recently listened to a discussion about mathematics and creativity between Professor Marcus du Sautoy and Reverend Giles Fraser. Professor du Sautoy is an atheist and Reverend Fraser is, of course, a Christian, but there was some fascinating common ground between them on the nature of human thought and consciousness. I found interesting the belief expressed by du Sautoy that mathematical objects have a reality beyond our own conception of them, and indeed beyond even the physical universe. Fraser viewed this as almost a theological statement. I came across this platonic view of numbers in university but did not meet any lecturers who professed any great passion for it. I do not believe it myself, but it is a nice way of explaining the apparent universality of mathematical truths across boundaries of culture and language, and the usefulness of mathematics in modelling and predicting the physical world. An even more interesting explanation for the universality of mathematics that du Sautoy mentioned in passing was the idea that it represents the study, not of the physical world or a domain in itself, but of the fundamental processes of human thought. In other words, it is the study of consciousness. This idea, I had not encountered before. Thinking about it over the last few days, I remembered some observations that I made when I first studied set theory (a branch of pure maths), of parallels with key Buddhist teachings. At the time I did not see these parallels as more than a coincidence. In light of the suggestion that mathematics may be the study, not of the physical world, but of the nature of thought, I have revisited those ideas and would like to write here about two of them in particular. Imagine a universe that contains nothing. There are no objects, no forces or relationships, nothing whatsoever. However, we are allowed to do one thing in this empty universe. We are allowed to create a set. In other words, we can categorise. We can draw distinctions between one thing and something else. But how can we use this power of discrimination in an empty universe? We create, as the first object, the empty set. We create the category of nothingness. The empty set is defined as the set containing no objects. In other words, we draw a big circle around part of the nothingness and say, there is nothing in here. But that is now something! The set which contains emptiness is now an object, indeed it is the first and only one in the universe. So, when we put that in a set, we get the set which contains exactly one object. It is the first number, the number one. We can make the number two out of the set which contains both the empty set and the number one. And so on, until we have populated the universe with all the numbers possible. The striking parallel here is with the Buddhist teaching on emptiness and form. That basic emptiness from which the whole mathematical universe emerges remains at the heart of every object in the creation. If you break each number down, in the end it is nothing other than emptiness, divided and subdivided in different ways. The ability to form a set, or categorise things, is surely nothing other than the basic function of the discriminating mind. We can be tempted to view form and emptiness, discrimination and the non-dual, as opposite ways of viewing the world. In maths, they go hand in hand and it is from the dynamic interplay between the two that the world as we perceive it arises. One could go even further and say that in set theory, the discriminating mind does not so much perceive the world, as create it. The act of creation is discrimination itself applied to the vast potential of emptiness. First, it turned out to be possible for Hercules to defeat the Hydra. Second, it turned out to be impossible for him to fail! That is, provided he kept at it. It seems incredible, but subtracting one again and again from a number which increases by two each time eventually results in zero. The subtractions somehow catch up with the faster additions! This happens over an “uncountable” length of time, but it happens. 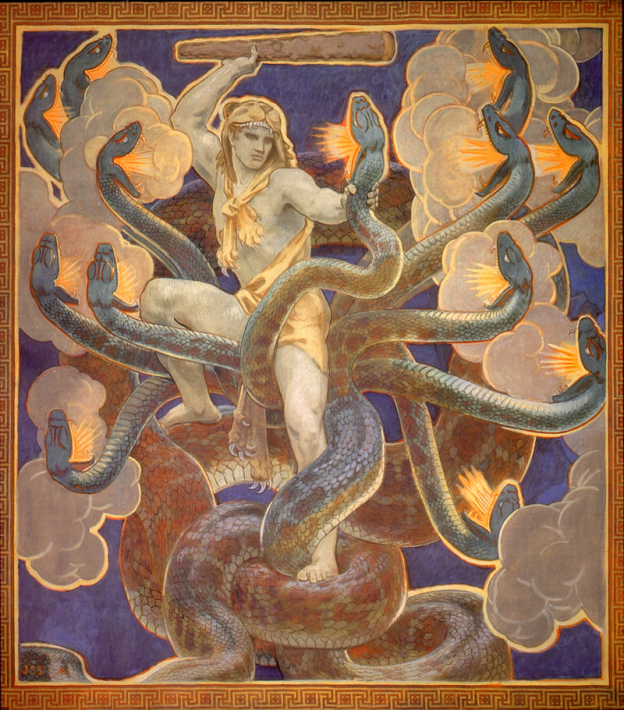 In fact, even if the Hydra were to grow ten new heads, a hundred new heads, any number of new heads at each iteration, Hercules would eventually defeat it. I can’t help thinking of the Bodhisattva vows in the context of this problem. We routinely recite “however innumerable beings may be, I vow to save them all,” amongst other apparently impossible commitments. But mathematically, it is not only possible for us to succeed, but impossible for us to fail… on one condition. We have to stick at it, one being at a time, one generation after another, passing on the commitment through the ages for an uncountable number of years. Eventual victory is not a poetic idea, a romantic or paradoxical notion. It is a proven mathematical truth. This entry was posted in General on April 15, 2019 by Colin Shinjo Salmon.